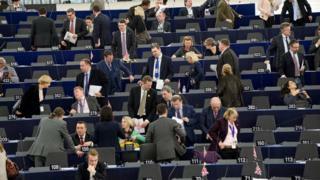 In the European Parliament, MEPs sit in political groups that cross national boundaries. Groups can and do change their formation or name from time to time, and political parties can switch their affinities. Being part of a political group gives parties access to funding to cover staff and administrative costs, as well as a greater chance of getting their MEPs elected as chairs of the Parliament's committees. It will also give a party's MEPs more speaking time during debates, as the number and length of contributions during debates is determined by group size. Seven groups were initially formed following the 2014 European Parliament elections - this increased to eight in June 2015, with the creation of the Europe of Nations and Freedom bloc of anti-EU nationalist parties. According to the Parliament's rules, each group must have at least 25 MEPs from a minimum of seven member states. There are also a number of MEPs who do not belong to any group, known as non-attached members (or the "non-inscrits" in EU jargon). This is the biggest group in the European Parliament, containing some of the EU's longest-established political parties. This used to be the home of the UK Conservatives before they left to set up a more Eurosceptic group in 2009. It is broadly centre-right, and enthusiastic about deeper EU integration. Along with the Socialist group, the EPP it has traditionally been one of the two powerhouses of the Parliament, providing most of its presidents and vice-presidents. Eight out of the Parliament's 20 permanent standing committees are currently chaired by MEPs from the group. Around half of the European Commission are also members of the wider EPP party, including Commission President Jean-Claude Juncker. German Christian Democrats make up the biggest delegation in the group - Manfred Weber, from the CSU's Bavarian sister party, is the group's leader. Formerly known simply as the Socialist group, the group is the home of Labour party MEPs from the UK. It is the main centre-left group in the Parliament, and for many years was the biggest group in Brussels, although that crown has since been taken by the EPP. Along with the EPP, it tends to get the lion's share of top jobs in the Parliament. Current Parliament President Martin Schulz is a member, and stood unsuccessfully as the group's proposed candidate for Commission President in 2014. The chair of the group is the Italian MEP Gianni Pittella. One of the big winners of the 2014 elections, the group rose to third place, despite a drop in support for one of its biggest components, the UK Conservatives. The origin of this group can be found in David Cameron's desire for the Conservatives to leave the federalist EPP and set up a new right-of-centre Eurosceptic group at the time of the 2009 elections. Alongside the Conservatives, the biggest delegation is Poland's Law and Justice Party, and the group also contains - among others - the Ulster Unionists and Alternative for Germany party. Broadly centre-right and Eurosceptic, it contains a mixture of groups that are more socially conservative and those that promote economic liberalism. British Conservative MEP Syed Kamall is the group's leader. The main centrist group in the Parliament, ALDE saw its overall numbers take a hit at the 2014 elections, mainly due to the sharp fall in support for its two biggest components, the UK Liberal Democrats and the German Free Democrats. One of the most Euro-enthusiastic groups in the Parliament, it has often held the balance of power in key votes and has been courted by both the Socialists and the EPP when majorities are sought. Analysis from the Votewatch Europe website has shown that the group won more plenary votes in the first year of the current Parliament term than any other. Former Belgian Prime Minister Guy Verhofstadt is the group's leader. As its name suggests, this is the group that can be found on the far left of the political spectrum, containing members from a number of Communist and traditional Socialist parties. Among the UK's 73 MEPs, the only one to sit in this group is Sinn Fein's Martina Anderson. It is broadly Eurosceptic, but from an anti-austerity or anti-capitalist point of view, rather than specifically on issues of national sovereignty. The group's full name represents the fact that it has traditionally contained left-wing environmentalist groups from Scandinavia. It is chaired by the German MEP Gabriele Zimmer. As its name suggests, this group is an alliance of two parties - the European Greens and the European Free Alliance, which primarily represents parties focused on regional or national interests such as the SNP, Plaid Cymru, and Catalan parties. The group generally takes a left of centre position on most issues, and - as the name would suggest - is the home of the UK's three Green Party MEPs. It is co-chaired by Rebecca Harms from Germany and Philippe Lamberts from Belgium. The EFDD contains MEPs who disagree with the idea of European integration from a broadly - but not exclusively - right-wing perspective. The UK provides the largest number of MEPs in this group, containing as it does the 22 MEPs from the UK Independence Party, with the 17 MEPs from Italy's Five Star Movement in second place. UKIP leader Nigel Farage is co-president of the group, along with the Five Star Movement's David Borrelli. The formation of the anti-EU ENF group was announced in June 2015, reportedly after over a year of on-off negotiations between previously non-attached members. The bulk of the group's MEPs come from the French Front National (FN), whose leader, Marine le Pen, is also the group's head. The far-right FN had previously struggled to find members from enough countries to form a group. The bloc also includes Italy's Northern League and MEPs from the Dutch Freedom Party. It also includes ex-UKIP MEP Janice Atkinson, who was expelled from the party earlier in the year over an expenses scandal. Generally speaking, this cohort is made up of MEPs who have not been able to find enough allies to form a group of their own, or who have been rejected by other parties. However, it also contains MEPs who feel they do not fit into any of the other groups, such as the Democratic Unionst Party's sole MEP. In the main, the ranks of the non-attached are made up of nationalist MEPs, such as the three that come from Hungary's Jobbik party. There are also two MEPs from the Front National who are not part of the ENF group: Bruno Gollnisch and FN founder Jean-Marie Le Pen. Mr Le Pen was suspended from the party the month before the group formed, over his comments that the Holocaust was "a detail of history". Being unattached means that members have much less access to speaking time in the chamber, as well as fewer administrative and secretarial resources.